Here are some resources for you to check out if you are interested in learning more about the plastic free movement and various other environmental causes! A Plastic Ocean is a comprehensive documentary that follows the issue of plastic not only from an ocean pollution perspective but also from a human health perspective. I highly recommend it, but bear in mind it is quite long so you might want to break it up into a few viewing sessions. You can watch the trailer here. Bag It is a really charming documentary about an ordinary guy who makes it his mission to give up plastic. It becomes very personal and moving as the backdrop of the documentary shifts as Jeb’s wife gets pregnant and he starts to think more about the legacy of plastic for our children and future generations. You can watch the trailer here. “Plasticized” is a documentary that follows ‘The South Atlantic Crew’ who seek to measure the level of plastic waste in the ocean. They set out a trawling net every 60 nautical miles (rain or shine!) and examine the plastic fragments that they find. This documentary is great in showing just how real this problem is and showing the level of dedication of researchers in the field seeking to improve the state of our oceans. You can watch the whole movie online here. Not a documentary, but I recommend Story of Stuff’s videos on microfibres, microbeads and bottled water. They are excellent and succinct overviews of the issue. “An Inconvenient Truth” – I think most people have seen this, but it is an important starting point if you’re looking to learn more about climate change. It was really important in creating a real sensation and getting lots of people interested in the potential impacts of climate change. There were some controversies over the film, mainly regarding the political intentions of Gore as well as distorting scientific fact to exaggerate, but it is laid out very nicely with a more personal storyline running throughout. An Inconvenient Truth II was released last year, but to be honest I think it was not as culturally significant as the first, probably because we are hearing about and experiencing climate change a lot more now than we were when the first documentary came out. “Dirt!” is a great movie about the perils of soil degradation. The movie interviews many different academics, scientists, farmers and politicians who examine the issue and outline potential solutions to this problem. It’s a really great portrayal of an issue that isn’t exactly high profile. You can watch the trailer here, or the whole movie is available here. “Blackfish” is a documentary that focuses on Tilikum, an orca that showed incidents of aggression when it was being held at SeaWorld. The documentary interviews people who were involved at the beginning of the business plan of SeaWorld, with the original capture of whales from the wild and following straight through to the death of Dawn Brancheau in 2010. Though it offers a lot of information about the dangers of holding wild animals in captivity, and exposes a lot of previously unknown information about how animals are treated at SeaWorld, it was criticized by SeaWorld for being misleading and leaving out any mention about the rescue and rehabilitation efforts of the park. Overall, I though it was great, but definitely should be paired with some personal research. You can watch the trailer here, and the full documentary can be found on Netflix. “Dive!” This movie is so wonderful! It follows a great group of friends who ‘dumpster dive’, which means going into bins and taking all the food that has been unnecessarily thrown out that day. The documentary then progresses into examining our broken food system, choosing to investigate why all the food is there in the first place. Jeremy Seifert, the documentary maker, outlines the flawed global food distribution system and what we can do to help. You can watch the trailer here, although personally I think the trailer doesn’t sell it enough! The movie really is wonderful and opens your eyes to a lot of really tough issues. “Sharkwater” is a documentary that follows Rob Stewart, a nature photographer who has a great passion for sharks. He seeks to remedy the popular image of sharks as villains. He investigates the shark finning industry, and the documentary follows his experiences with the Sea Shepherd Conservation Society. The documentary gives a lot of information, but take it with a pinch of salt – Sea Shepherd has some very unorthodox techniques that I don’t always agree with. The organisation has been accused of being overly violent, and of impacting the legitimacy of mainstream marine movements. *Update in 2018, this documentary has become even more meaningful since Rob Stewart’s untimely death last year while diving. “Shark bait” is another documentary about shark finning that follows the famous chef Gordon Ramsay who seeks to expose the horrifying shark finning industry. This film is great at exposing all the interests at stake, and showing how terrifying it can be to get in the middle of this multi-million dollar industry, but Ramsay was later criticized for engaging in recreational shark fishing. You can find a short clip from the movie here, but sometimes you can find the full documentary on Channel 4 on demand if you are in the UK. “The Blue Planet” is a nature documentary series narrated by the one and only David Attenborough. If you don’t know much about the oceans, this is an amazing educational documentary with breathtaking footage. I highly recommend it! Blue Planet II was recently released and had some powerful messages about plastic pollution and how it is affecting our ocean. If you’re interested in the doing a deeper dive into plastic and waste, I highly recommend checking out the following reports and journal articles. What a Waste 2.0: A Global Snapshot of Solid Waste Management to 2050 can be found here. This is a super interesting look at waste management all over the world. The original report (click here) was from 2012, the latest version was updated in 2018. This is the famous paper on plastic waste inputs into the ocean by Jenna Jambeck et al 2015 to assess the amount of plastic entering the ocean each year, which they put at between 4 to 12 million metric tons. Click here for the article. This is also a recent paper they just put out on the implications of the China ban on recycling, super interesting stuff, click here. I really just love everything that comes out of her research! The Food Packaging Forum and they have a lot of rally interesting research about the human health implications of different food packaging materials. Check them out here . I also put together a whole bunch of research for our infographic, and I’ve attached that here. This has been reviewed by the Food Packaging Forum and they’re giving further insight as we develop the infographic more. The British Plastic Federation report is a long one, but this BBC article distills it quite well. Stemming the Tide, the controversial report sponsored by Dow and Coca-Cola that prioritised ending leakage/promoting incineration. Interesting read but super important to keep in mind why it was commissioned and authored, find it here. http://myplasticfreelife.com/ – the woman who totally inspires me in all of this! Beth Terry has been plastic free for over 11 years and she’s AMAZING. Check out her site for tons of resources and inspiration! https://www.plasticpollutioncoalition.org/ for great, up to date information plastic and lots of resources on living plastic free. https://treadingmyownpath.com/ – Lindsay does a great job of sharing practical tips and thoughts on waste. https://www.5gyres.org/ for science-based recommendations and updates from expeditions. There are a lot of people in the Zero Waste/Plastic free space now, a lot more than when I started back in 2013. I prioritise seeing diverse content with voices from different backgrounds as I think it adds a lot more value to the conversation than just middle class young white women who can fit their waste in a mason jar (sorry). @zerowastehabesha for lots of resources on environmental racism and inequality. She also runs the #RepresentationMatters series to highlight young activist of colour in this space. @she.is.awake Antónia is an amazing woman who recently ran a donation campaign to bring waste free kits to Angola, her native country (check out @lixo.zero.angola). Just a little note: I’ll be updating the resource section constantly, so if you have anything that you think might be appropriate here just send me an email at noplasticplease123@gmail.com to suggest it! Thanks! 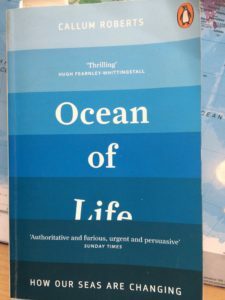 This book, written by a professor of marine conservation, thoroughly examines our relationship with the oceans, starting with a geological explanation of how oceans physically came about, as well as examining ancient civilizations’ relationship with the sea. Roberts then systematically looks into each issue that plagues our oceans in modern times. A great read, and the perfect amount of ‘science’ in there for those of us who are less inclined towards facts and figures! This book focuses on our broken fishing industry. They begin by outlining the growth of the global fishing industry and how the structure leads to negative impacts on our oceans. The authors also address the attempts made to regulate this industry, and how those have succeeded and failed. 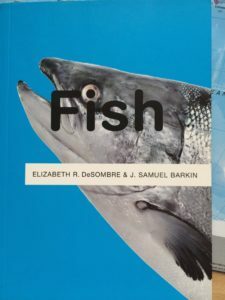 The final sections focus on the aquaculture industry, finishing the book with how consumers can use their choices to positively influence the global fisheries system. This book was an awesome Christmas gift given to me by my younger sister! It’s a really great guide on how to massively minimize your waste in the home. 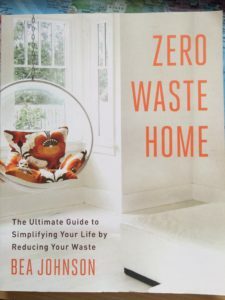 The author, who is a mom of two children, gives great practical advice on how to get rid of waste in all sections of life: your bathroom, your kitchen, in your grocery shopping, in your gift-giving.. The list goes on and on. It’s really inspirational to see how much of an impact she’s made just by being a more conscientious consumer.